Visual Renamer - you won't imagine renaming template that it can not perform! This most powerful batch renaming tool is unique. Apart from common features of batch renaming, preview & undo options, it can rename karaoke files, supports THM, EXIF, MP3 tags, and has lots of different filters to sort out files, including manual sorting. Besides, Visual Renamer allows you to create your own custom scripts. Any renaming can be done if you have Visual Renamer. You could assume Visual Renamer is too complicated for a regular user. Nothing like that! No command lines, no obscure mask functions, no complicated rules.VisualRenamers employs WYSIWYG function (what you see is what you get) to make batch renaming a simple and straightforward process. Renaming functions including but not limited to enumerating, extension swapping, replacing umlauts and other non-standard characters with ASCII characters are done in few clicks. 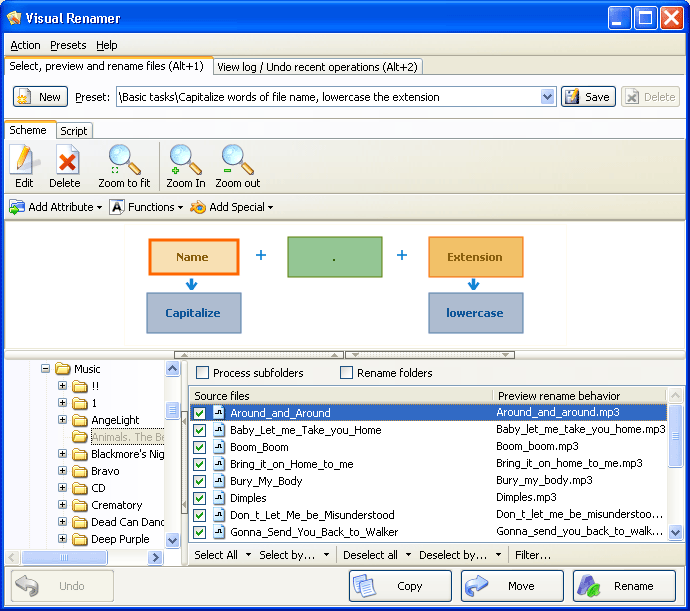 While VisualRenamer was created with professional users in mind (designers, programmers, webmasters and other categories), software primary target are inexperienced users who have large mp3 file collections and own digital camera, and thus can take advantage of a batch renamer that saves time and requires no special knowledge to operate. Any renaming can be EASILY done if you have Visual Renamer. Linux data recovery software is competent to recover linux deleted files from ext2 & ext3 file systems of Linux based OS. Linux file recovery software can effectively recover and restore Ext2 & Ext3 partition from crashed linux hard disk drive. Database converter utility migrate the selected table or the whole database from MYSQL to MSSQL. This conversion software overwrites primary, unique key, indexes, default values and other attributes from MYSQL to Microsoft Structured query language. Registry repair software is an excellent utility which helps in keeping your PC clean and free from Windows registry corruption. This software scans your PC and fixes all the errors that make your system slow and decrease system performance. ID Harddisk Cleaner is an efficient organized cleaner of your disk-space, securing files and data while ensuring extra usage space and improved running-performances for your PC. Notes Address Book Converter Software is a reliable Lotus Notes Address Book conversion tool to convert & export Lotus Notes Address Book to Outlook. Software is designed to convert names.nsf to Outlook. This data recovery NTFS software is a trusting NTFS file recovery tool to retrieve NTFS drive of Windows OS. NTFS recovery software can get back deleted NTFS files from Windows recycle bin that has been emptied. Exchange Server Data Recovery is no more a difficult and cumbersome task. You can perform it instantly and effortlessly with the help of Kernel for Exchange Server Recovery. To know more, download its trial version and use it to restore EDB files. It is often the unfortunate situation that files are lost from disks (eg flash cards, hard drives etc). It is therefore vital to possess a powerful tool that can get back as much missing data as possible. This site does not contain serial number, crack, keygen Visual Renamer serial number : serial number is the simplest type of crack. A serial number(cdkey,product key,etc) is register the program as you may already know. a crack or keygen may contain harmful software. If you cannot find the exact version you want, just give it a try. for more information read .nfo/.txt/.diz file include in zipped file.